This summer has brought extreme weather to everyone across the country. Weather can be deadly, whether in the form of heat, tornadoes, lightning or flash floods. Fortunately, we live in a time where technology makes advance warning possible. Watching your local news is one way to stay on top of the weather. Especially today, conditions can change quickly. You may not be watching when that critical life-saving information comes through. 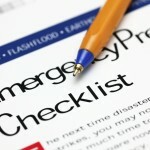 There are ways that you can be notified when severe weather strikes. Weather radio – A cheap and foolproof way to be notified of severe weather and other emergencies. The National Oceanic and Atmospheric Administration (NOAA) broadcasts general weather information on different frequencies than normal FM radio. Therefore a special (cheap!) receiver is required. The receiver can be set to sound an alarm when there is an emergency, weather or otherwise — leaving you free to set it and forget it’s there, until you need it. Amazon has some great options. To avoid false-alarms, look for a receiver with S.A.M.E. (Specific Area Message Encoding), which only sounds an alarm to emergencies that pertain to the county you live in. Weather.com – You can sign up to receive weather alerts on your cell phone via text message — a great unobtrusive way to stay informed on the go. However, if your home is located in an area that regularly experiences tornadoes or flooding you may want to go with a weather radio. Severe weather could disrupt cell service, and a text message on your phone may not wake you up at night. Smartphone – Whatever type you have, there are many free and cheap apps that keep you apprised of up-to-the-minute weather conditions. WeatherBug, available on iOS and Android, gives you access to the latest weather near your location. It also includes a feature that shows you how far away lightning is striking. http://www.nws.noaa.gov/om/hazstats/resources/hazstat-chart12.gif – A chart depicting weather fatalities by cause.